The one and two-point statistical structure of very high Reynolds number turbulence in the surface layer near a rigid `wall' is analysed. The essential mechanisms for turbulent eddies impinging on the wall are studied using linearised rapid distortion theory, which show how the mean shear and blocking actions of the surface act first independently and then, over the life time of the eddy, interactively. 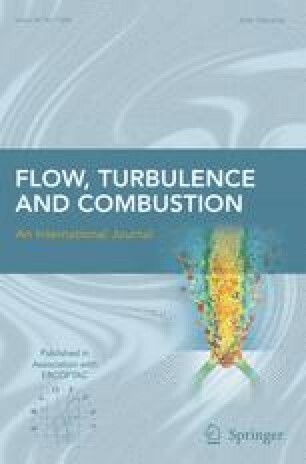 Previous analytical results are reinterpreted and some new results are derived to show how the integral length scales, cross correlations and spectra of the different components of the turbulence are distorted depending on the form of the spectra of eddies above the surface layer and how they are related to motions of characteristic eddy structures near the surface. These results are applied to derive some quantitative and qualitative predictions in the surface layers (SL), where the eddies are affected by local shear dynamics, and in the `eddy surface layer' (ESL) where quasi independents loping elongated eddies interact directly with the wall, and where there is a large range of wave number within which the spectra of the horizontal velocity components are proportional to k −1. The longest eddies in the boundary layer occur near the wall. Field experiments agree with the theoretical model predictions for the quite different forms for the spectra, cospectra and cross correlations for the vertical and horizontal components of the velocity field. By showing that in SL the energy exchange between the large and small scale eddies is local(`staircase') energy cascade, whereas in ESL there is a direct nonlocal (`elevator-like')energy transfer to the small scales, it is shown why the thickness of the ESL increases over rougher surfaces and as the Reynolds number decreases.